I think I may have gotten slightly off-topic. What I’m saying is, for most people, good quality, home-made mac and cheese is a real treat so adding a bit of luxury to it just makes it even better. There’s something irresistibly compelling about a highbrow/lowbrow combination, right? The cozy thing becomes elevated, and the fancy thing becomes accessible. *Nerd alert: This is completely off topic but I have recently discovered The Worst Cat Tumblr page and, I’m not even exaggerating, Matt and I laughed so hard for about 10 minutes straight, to the point that I thought I might need medical intervention. This is probably my favorite. 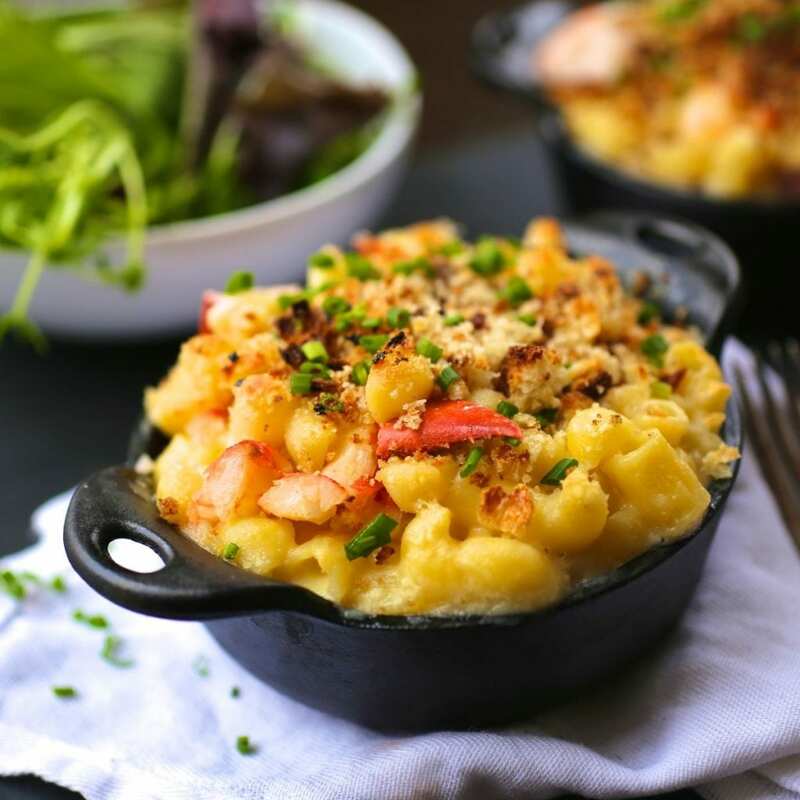 As good as the lobster was, even without it this was the best mac and cheese we’ve ever made. 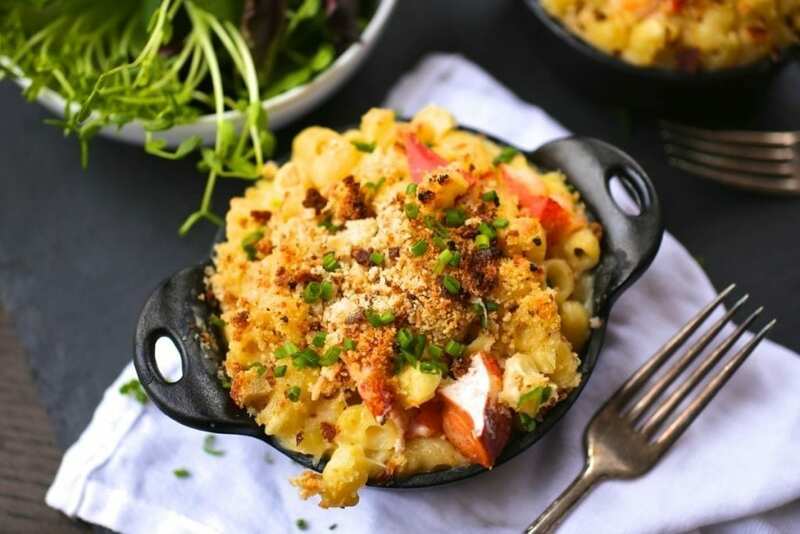 The combination of three cheeses (cheddar, gruyere and fontina) is just delicious and the lemony-garlicky breadcrumbs on top give it great texture and crunch. I based it off of this Barefoot Contessa recipe, though I added the fontina and the lemon/garlic topping). If you’re not familiar with it, fontina is a mild Italian cow’s milk cheese that melts really well. I love the silkiness it adds to the sauce, but you could certainly stay with the classic combo of cheddar and gruyere. Don’t overcook the lobster or it can become tough. If you don’t have fresh breadcrumbs, try using panko instead. 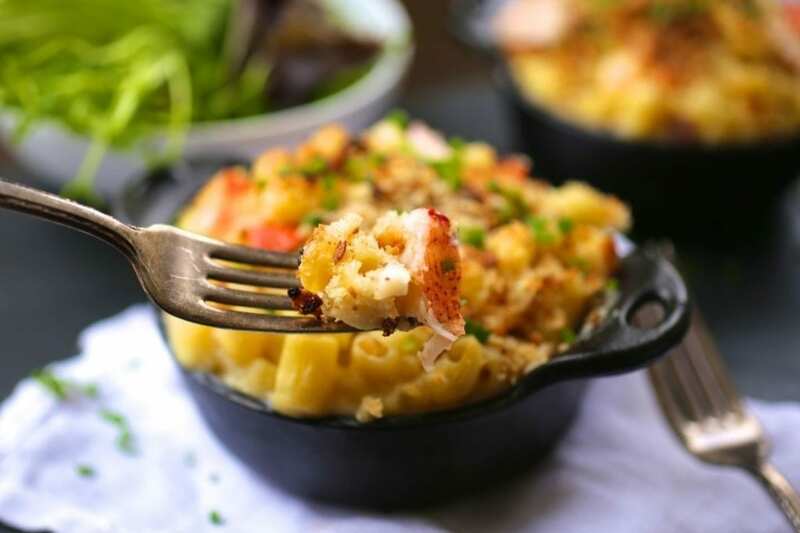 You can assemble everything up to a day ahead and then bake the lobster mac and cheese straight out of the refrigerator. I’m obsessed with these little cast-iron gratin dishes but you could use porcelain ones or a large 9 X 13 baking dish instead. Cook the pasta in well-salted water (for timing, use package directions but make sure the noodles are al dente). Drain and set aside. While pasta is cooking, make the cheese sauce. Melt 4 tablespoons of butter in a large, heavy saucepan over medium heat. Add the flour and the mustard powder and whisk to combine. Cook over medium-low heat for about 2-3 minutes, whisking constantly. Slowly add the milk while whisking and cook over medium heat for about 5 minutes or until the sauce thickens (it won’t thicken fully until it’s almost at a boil), whisking often. Add the hot sauce. Turn heat to low and cook for about 10 minutes, stirring occasionally. Next, prepare the breadcrumb topping. Melt 2 tablespoons of butter in a small skillet over medium high heat. When the butter stops foaming add the garlic and cook for 30 seconds or until fragrant. Add the breadcrumbs and toss with the butter, Raise the heat to med-high and toast for a few minutes until the bread crumbs become golden. Stir in the lemon zest and season with kosher salt and fresh pepper. Remove from heat to cool. Once the sauce has thickened, remove from heat and slowly add the cheeses a handful at a time until it’s all incorporated, stirring with each addition. If the cheese isn't melting, turn the burner on low and heat just until the cheese melts and becomes smooth with the sauce. Add the drained pasta to the sauce and stir to combine, making sure the sauce evenly coats the pasta. It will look like a lot of sauce but the pasta will soak it up while it bakes. Gently fold in the lobster meat. Spoon the mixture into a buttered 9 X 13 baking dish or 6 - 8 small gratin dishes. Sprinkle the bread crumb mixture on top of the pasta and bake for about 20 - 25 minutes, until the pasta is bubbly and lightly browned on top. NOTE: You can make this up to a day ahead and refrigerate until ready to use. It may need a few extra minutes in the oven to become bubbly and hot. Okay, first, this look so so good. I wish I had a big bowl of it in front of me right now (even if it is only 9:39 AM…). But second! A friend of mine who is fully capable of eating dairy products w/o gastrointestinal distress HATES macaroni and cheese! I really, really do not understand it. What’s not to love?? Also, holy crap, The Worst Cat tumblr is amazing. I think people who say they hate M&C probably just have never had a good one, right? That’s the only explanation I can come up with. And I could look at Worst Cat ALL DAY. 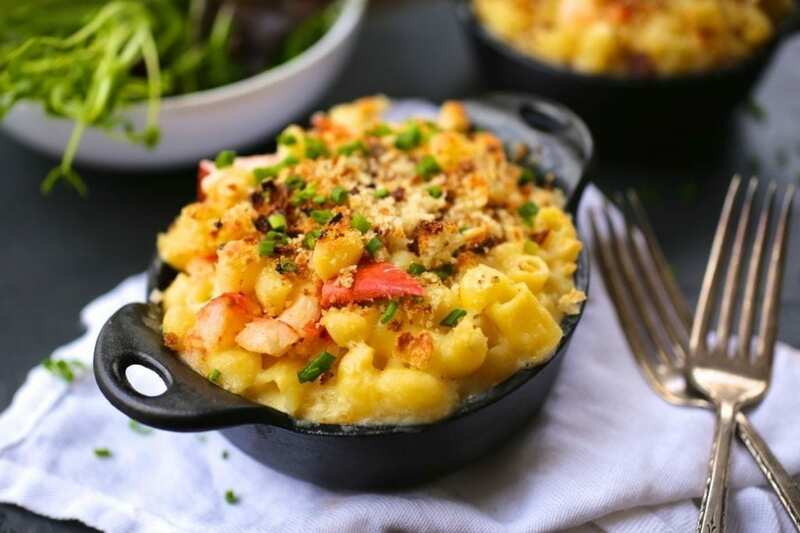 Mac and cheese is just my ultimate comfort food.. loving the addition of lobster here. I have to make the recipe! I just found this blog and I love it, and also – I am marrying a man who claims to hate mac and cheese. “It’s just so heavy and fatty,” he whines, putting away a pound and a half of pork barbecue. I know, right? I’ll get to him yet.